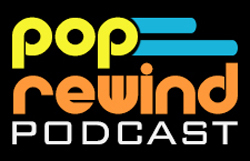 Pop Rewind — 90s Moments You Forgot: got milk? 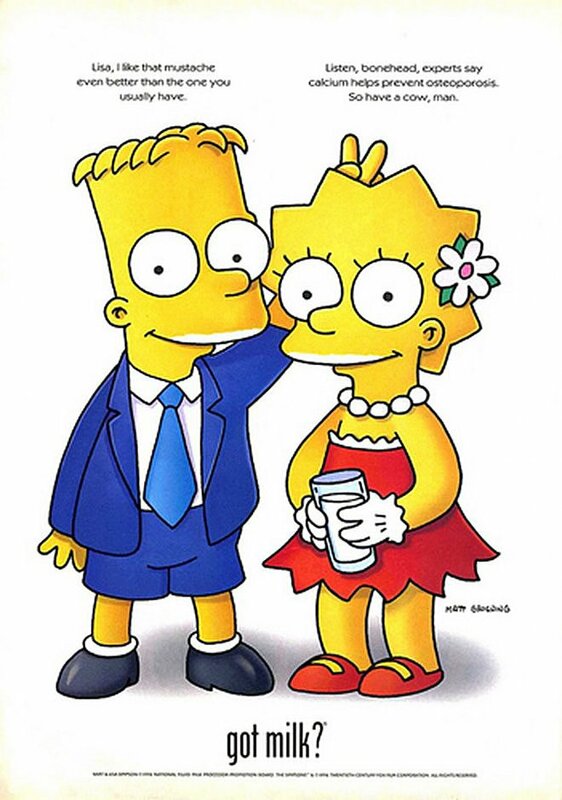 90s Moments You Forgot: got milk? How much milk do you drink in a day? Me, I have a bit with my coffee a smidgen in my cereal. Not a whole lot. A bag of milk (Oh, Canada) can last me a lot longer than I should ever keep milk in the fridge. From October 1993 to February 2014, the California Milk Processor Board (and other milk processors and dairy farmers across the U.S.) aimed to change that. Although it didn’t work too well on me, and maybe it didn’t work too well on anyone, the “got milk?” and milk mustache ads were everywhere. 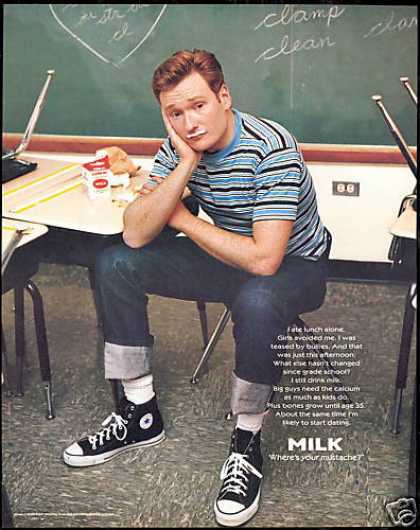 You them on your bedroom walls (Conan O’Brien sitting at a grade school desk with the “got milk?” slogan was naturally my choice) or the inside of your locker door. These things were everywhere. And then they weren’t. The first got milk? commercial ran in October 1993. To be honest with you, I totally forgot about this commercial. The got milk? print ads were more my area of interest (again, Conan reasons), but as soon as I ran across this commercial I remembered how big it ended up being. Did you know: that first milk commercial was directed by Michael Bay. Talk about peaking early. The print ads I’m obsessing about today feature a celebrity or group of celebrities with milk mustaches that tout the benefits of drinking milk. Seems like 90s stars just aren’t pulling their weight anymore when it comes to milk. All ilk of celebrity got into this– comedians, boy bands, teen idols, sports stars, the cast of Frasier– but I’m still not into milk. Maybe miak. Or malk. 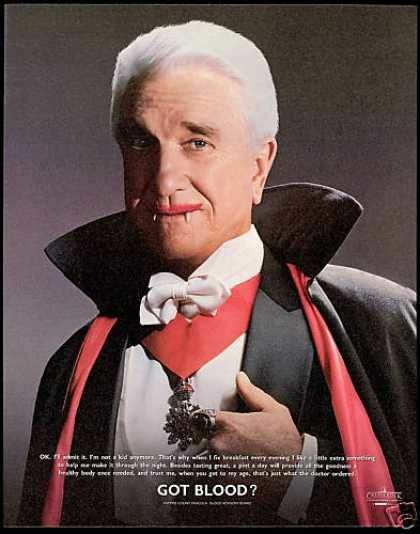 Check out some galleries of these magnificently 90s advertisements over on Pop Sugar and Vintage Ad Browser. If you’re feeling especially crafty and festive, you can even put together this lovely got milk? 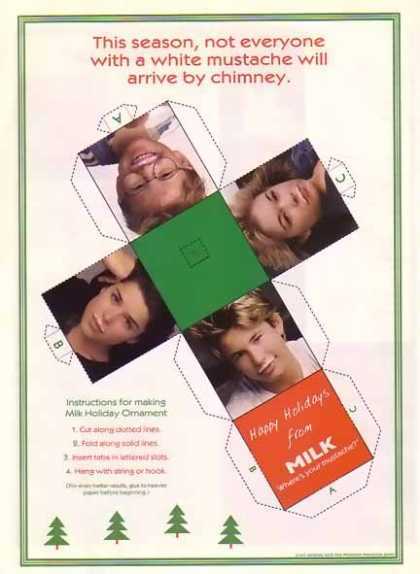 ornament for your tree, starring Neve Campbell, JTT, Leann Rimes, and the kid from Jerry Maguire. More 90s for your 90s. Like any solid ad campaign, got milk? was also treated to various parodies. The California Milk Processor Board itself released a poster called “got ripped off?” that listed the top 100 spoofs of their slogan. 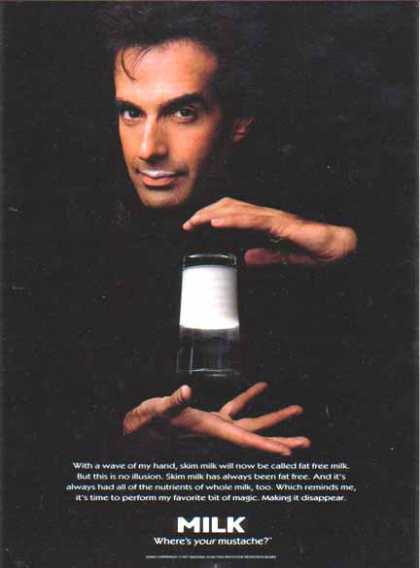 But perhaps it wasn’t until 1997, when Weird Al parodied the campaign on The Weird Al Show, that the got milk? slogan finally made it.